Have the ATCoins made their way into your social media feeds? 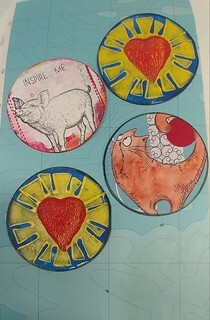 I love the idea of making ATCs into circles! Yay! Supposedly Joan Hodges "created" or came up with the idea and COINED the phrase Artist Trading Coins. So, who wants to give it a try? The coins are 2 1/2 inches in diameter. They fit perfectly in the artist trading card sleeves or pocket letter pages. You can cut them out by hand or use a punch or die. Be sure to make them sturdy. So, create a fabulous mixed media or hand drawn/hand painted ATCoin. Be sure to do original work (not a copy of your original work). Check out your partner's profile for inspiration but ultimately, this is sender's choice. You may draw, paint, collage, rubber stamp, etc. just be sure to put effort into your ATC and not sticker slap. Who is allowed in the swap? Just to be clear, are we only sending 1 ATCoin to our partner? Or is it multiple ATCoins to 1 partner? @stagking - I specify to only send 1 but feel free to send 2 if you want. 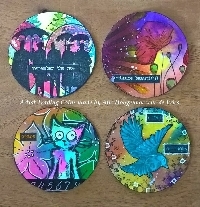 I couldn't wait to make some so I converted a couple extra ATCs into coins. I love this non-traditional shape! I don't know why, but it changes the ATC in such a nice way. I went to JoAnn's today to get some supplies and I found a 2 1/2 inch punch on the clearance isle. So much easier than drawing around a plastic cup then cutting out by hand. I've made tons of ATCs, but I've never made a coin, so I'm very excited to give it a try!